Is there anything Anna Wintour can’t do? In short – no. She appeared in the September Issue, as a comedienne alongside Seth Myers, and even reportedly rises at 5am every morning to play tennis before work. Now the Vogue editor appears on the cover of Business of Fashion’s latest print edition. 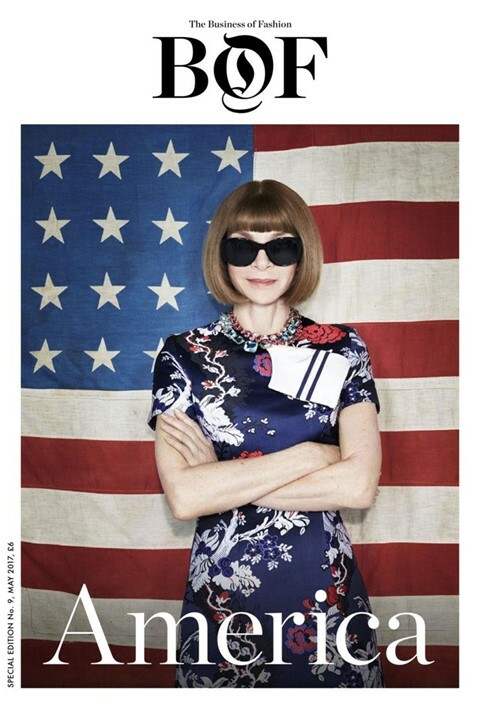 Photographed by Patrick Demarchelier, Wintour appears in front of the stars and stripes for the America-dedicated issue. It isn't a first for ‘Nuclear Wintour’ – she previously appeared on Industrie magazine's debut cover. Why Wintour, you might wonder? Editor-in-chief Imran Amed puts it best in his editor’s letter: “If there was a president of fashion, it would certainly be Wintour, who gives us her take on the current American reality.” An industry veteran, Wintour joined Condé Nast in 1983 and was announced as artistic director for all of the titles owned by the media company in 2013. Next November marks her 30th year at the helm of America’s fashion bible. Not to mention the fact that Wintour has been a driving force in fashion’s political engagement, notably during the 2016 election, when Vogue endorsed a candidate for the first time ever. Following the election, Wintour met with Trump to discuss the future. “I hope that President-elect Trump will be a successful president for us all,” she said in a statement. Appearing as your newly inaugurated fashion President, the issue will look at some of America's most notable fashion brands – Calvin Klein (which Wintour wears on the cover), Coach, Diane von Furstenberg and Oscar de la Renta. For the full Wintour spread you’ll have to wait until 27th April when the issue comes out. In the meantime, watch her cameo on Late Night with Seth Myers below.